Another indicator of more cross-generational thinking? The emergence of “all-age-friendly” (as opposed to “age-friendly”) community-planning initiatives is. As this smart post about the “All-Age-Friendly City” observes, “building trust between generations” is key to creating safe, green, accessible, communitarian living spaces. 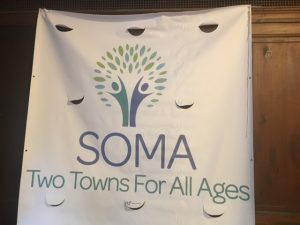 Here’s an actual sign, the name of a joint healthy aging initiative in South Orange and Maplewood, NJ, where I spoke last Thursday. And here’s a list of intergenerational programs in healthcare, infrastructure, and education. Totally agree , I am a person with a lot of mileage, and leader of 2 groups of Grandfamilies(that’s the name they chose for themselves) Raising Grandchildren in San Diego Ca. We are called ONE FOR EACH OTHER , UNO PARA EL OTRO (English/Spanish). We meet once month at a City Library Branch that embraced our program. I bring presenters of resources that they need, while the children are engaged in activities like arts and crafts , supervised homework etc. BUT… I have been thinking that we have to create a program, for the minors and the grandparents together, were THE ONE FOR EACH OTHER really takes place , and the minors understand the value of being raised by their grandparents and also learn to give back. I think this is all great and we must get connections between generations and to see that what helps any generation helps all generations. We must help the younger generations to see how public assistance for the older generations benefits them by having their parents and grandparents able to live independently. One issue I have with this posting is the idea that the down side of the current situation was “ the natural order of things was subverted”. There is no “natural order of things” in this regard. There is a “this is the way it was handled in the past” or some such. but I suggest it is wrong to infer that anything in the past is automatically the “natural order of things”. To some cultures the natural order is to put the elderly on an ice flow and send them off. Not sure we want to go back to this practice. Saying it was the “natural order” implies we have to get “back” to something vs move on to a new way of dealing. I am not in favor of this thinking mainly because we tend to take the going back literally vs philosophically or metaphorically. There is no “going back” to the old ways. We confuse the what we need to do with the how we need to get there.